October 29, 2009, US Airways announced it is realigning its operations to focus on the airline's core network strengths, which include hubs in Charlotte, Philadelphia and Phoenix, and a focus city at Washington's National Airport. These four cities, as well as the airline's popular hourly Shuttle service between New York's LaGuardia Airport, Boston and Ronald Reagan Washington National Airport, will serve as the cornerstone of the airline's network. By the end of 2010 they will represent 99 percent of the airline's available seat miles versus roughly 93 percent today. 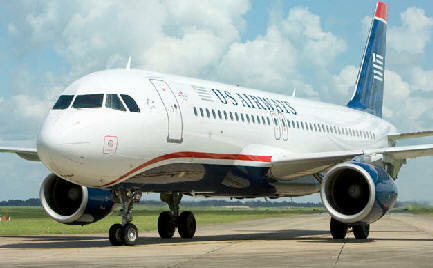 In a letter to employees US Airways Chairman and CEO Doug Parker outlined the changes, "Today we are announcing a realignment intended to focus on our key network strengths at our hubs in Charlotte, Philadelphia and Phoenix, our focus city at Ronald Reagan Washington National Airport and our Shuttle service. By concentrating on our strengths we will be better positioned to return US Airways to profitability, which will result in a more consistent experience for our customers, better returns for our shareholders and greater job stability and career opportunities for our employees." Redeploying the airline's 15 E-190 aircraft on routes between Boston (BOS) and Philadelphia and on the Boston-LaGuardia (LGA) leg of the US Airways Shuttle. Suspending five European destinations from US Airways' international gateway in Philadelphia, given the weakness in trans-Atlantic revenue: Birmingham, U.K. (BHX); London Gatwick, U.K. (LGW); Milan, Italy (MXP); Shannon, Ireland (SNN); and Stockholm, Sweden (ARN). Seasonal service to Brussels, Belgium (BRU) and Zurich, Switzerland (ZRH) will transition to year-round service in late 2010. As part of the initiatives outlined above, US Airways will reduce its staffing by approximately 1,000 positions across its system during the first half of 2010. These reductions include approximately 600 airport passenger and ramp service positions, approximately 200 pilot positions and approximately 150 flight attendant positions. Addressing the airline's employees in a personal letter, Parker said, "These are difficult decisions to make because of the impact to some of our fellow employees. They are, however, the right decisions. By focusing on our strengths and eliminating unprofitable flying we will increase the likelihood of returning US Airways to long-term profitability, which is in all of our best interests. As we work through these changes, we'll do all we can to minimize the impact of these reductions on our current employees." Domestic and International Schedule Changes: Charlotte: US Airways has a proud history of serving Charlotte, N.C. that was solidified when it merged with the former Piedmont Airlines in 1989. Today, the airline operates more than 500 daily flights to 121 destinations from its Charlotte hub, including 19 international destinations. Over the past year, US Airways has added international service from Charlotte to Montreal and to Paris. In December 2009, the airline will inaugurate service from Charlotte to Honolulu and to Rio de Janeiro. Charlotte is also home to one of the airline's two flight crew training centers. Housed in a two-story 200,000-square-foot state-of-the art center are 13 full-flight simulator bays, two cabin emergency trainers and 25 classrooms dedicated to training the airline's pilots and flight attendants who are based throughout the airline's East Coast and international network. The airline also operates line maintenance, which consists of overnight inspections and routine maintenance work, and heavy maintenance, which consists of overhaul work on the Boeing 737 and 757 fleets, at Charlotte Douglas International Airport. Other important elements of the airline's operation that reside in Charlotte include its central baggage warehouse, a catering commissary operation, a ground service equipment center, and its primary distribution center for all aircraft components and parts. "With nearly 6,000 employees in Charlotte, and many of our operation support systems located here as well, we are certainly proud to call Charlotte home," said Parker. "We remain deeply committed to the community and citizens of Charlotte and surrounding regions, and look forward to identifying continued opportunities to bring flights from Charlotte to other regions of the world." Philadelphia: At US Airways' Philadelphia hub, which serves as the airline's Primary Intercontinental Gateway, the airline operates more than 400 daily flights and employs nearly 6,000 employees directly. The airline's presence also supports thousands of additional jobs indirectly. Although the airline is scaling back service in some softer markets as outlined above, markets where demand is strong have increased over the past year. This past summer, the airline inaugurated its first-ever market in the Middle East when it began operating daily nonstop flying to Tel Aviv from Philadelphia. Additional service to Oslo also began this past summer from Philadelphia, and as part of today's realignment, the airline announced it will transition seasonal flying to Brussels and Zurich to year-round service. In December of this year, the airline will increase its service from Philadelphia to Barbados. The airline also maintains a satellite headquarters team at Philadelphia, along with a significant line maintenance operation, catering commissary and a ground service equipment center. Parker noted, "Philadelphia provides a terrific gateway for our important trans-Atlantic network. Our Philadelphia team safely guides our operation amidst some of the most congested airspace in the world, and we couldn't be more proud of them. As we evaluated our international routes in Philadelphia, we made the necessary decisions to pull down capacity that simply isn't profitable in today's economic environment. However, we remain firmly committed to exploring additional opportunities as the economy slowly recovers, including re-evaluating our proposed China service in the future." Phoenix: US Airways has been part of the region's skyline since its merger with America West in 2005. With non-stop service to 80 destinations, including nine international cities, the airline is a strong corporate partner in the region. Today the airline operates more than 250 daily flights, and retains its corporate headquarters, as well as several administrative centers in nearby Tempe, Ariz. A maintenance hangar serving the airline's line maintenance needs employs several hundred of the airline's 8,700 employees who work in the region. Additionally, Phoenix-based flight crew members train at a state-of-the-art facility near Sky Harbor International Airport that is complete with 10 full-flight simulator bays, two cabin emergency trainers and 16 classrooms. "We are proud to serve as the hometown airline of Phoenix," Parker said. "While we have enjoyed success with serving international destinations in Mexico and Canada, we are also excited to launch our first nonstop Caribbean destination from Phoenix to Montego Bay in December." Ronald Reagan Washington National Airport: US Airways maintains a significant presence at Ronald Reagan Washington National Airport and recently announced plans to increase that presence. When its slot transaction with Delta Air Lines is complete, the airline will operate nearly 230 daily flights to over 60 destinations. Eight markets will receive non-stop service that do not have it today, including Birmingham, Ala., Islip, N.Y., Ithaca, N.Y., Little Rock, Ark., Myrtle Beach, S.C., Pensacola, Fla., Savannah, Ga. and Tallahassee, Fla. The added service will also create additional jobs at Washington National, and the airline will ultimately have a total staff of approximately 550 at the airport. "We are extremely proud to build on our heritage at Washington National," Parker noted. "By continuing to serve smaller communities with the right size aircraft and increasing seats in communities where demand dictates, our plans to provide more non-stop service to our nation's capital are well on track." Customer Service Enhancements: Parker continued, "In addition to rightsizing our flying to better match demand, we're taking additional steps to ensure our customers receive industry-leading service. US Airways was first among the major network airlines in the important customer service metric of on-time performance in 2008, and we are running first again in 2009. We also recently announced that we'll install new lie-flat business-class seats with an advanced on-demand in-flight entertainment system. The first installation will begin next month on our Airbus wide-body aircraft, and will roll out on the line in December." The airline also recently announced that its customers can now access more than 250 airport clubs worldwide with a single membership through its Star Alliance. Access now includes reciprocal club access with Star's newest member, Continental Airlines, as well as to United's Red Carpet Clubs. Other Star Alliance lounges are also accessible with a single, standard membership. Club members will also enjoy complimentary house selections of beer and wine in all of US Airways Clubs.